Camp Sunset campers wash dishes the Leave-No-Trace way. Leave your campsite better than you found it. That’s a golden rule of responsible camping, and one that we did our best to keep at Camp Sunset, the two-night outing at California‘s Big Basin Redwoods State Park that became the basis of our May 2015 cover story. We had a little help staying on track. Two expert eco-campers with the Subaru/Leave No Trace Traveling Trainers Program, Danielle Rowland and Roland Mott, joined us for the weekend at Big Basin. Check out the helpful video Dani and Roland made with us for more. 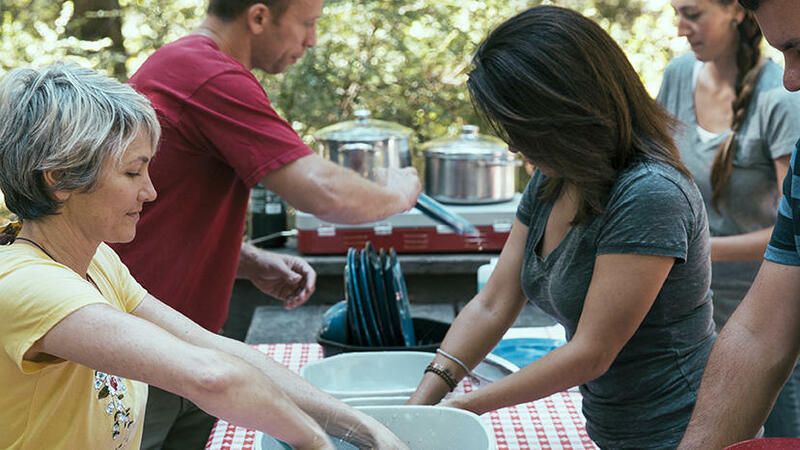 A little elbow grease—and some eco awareness—mean clean dishes and a clean campsite.